One can tell from his business casual clothes and over-confident stride, that he’s an American. The hotel’s welcome banner explains his presence in China: a conference of international suppliers for some Chinese brand. “Bing shui” (冰水) or ice-cold water has become an important piece of his vocabulary in China where he can never seem to get any goddamn ice water. He gives his American-centric order so cockily and with such Mid-Western intonation that one wonders if he thinks he’s at a Denny’s diner in Ohio. Why he assumes the waiter knows “eggs over-easy” in English but not “ice water” remains unclear. Is there anything worse than the ‘foreigner doing loud English rudely abroad’? Agreed. As a fellow American, the complete self-absorbtion of the loud American asking for ice, was painful to watch. The world, dammit, revolves solely around him. Ha! I think it’s a compliment, but I’m not quite sure.. Your latest post made me nostalgic for Zhuhai once again. Aside from reflecting badly upon oneself, it’s probably not prudent being rude or condescending since food and beverages pass through the server’s hand before it reaches one’s mouth. Love that punch line at the end! Have you seen this being a bigger issue amongst us foreigners than daily occurrences of mainland waitstaff hovering over the table as if A) our prescient selves already B)memorized the meanings of each of the Chinese characters in the menu? Or the usual practice of providing ONE menu (if there’s a Chinese person, he/she could presumably be the host, in which case, sure, the host orders) to a gaggle of aloof 外来人? My favorite event is at roadside bbq stalls when customers get…peckish and start to do the grilling themselves… Having a good time away from HK at least? “Bing shui man” was, fortunately, a rare breed. But someone who deserves special mention. It was a very nice week away from HK, but I’ve also been (happily) surprised to be back “home.” Two weeks from now we’re off to Zhuhai: using the second entry of my precious dual entry visa. 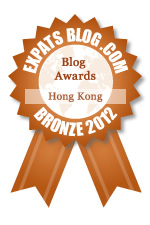 Do you know if us Beautiful Country folk can still get visas at the office in Wan Chai? Are you going to take the boat over to Jiuzhou, Zhuhai, or is there a closer terminus to Gongbei? I still reckon unfortunately that it’s by far the fastest way to get over there from HK. The hike up to Luo Hu bus station from TST is at least 45 minutes, excluding immigration, so the boat right there has it beat on time. If for some reason you need to get from Guangzhou to Zhuhai, there’s HSR now; haven’t taken it yet, but just a friendly reminder. Also, Foshan Airport is getting more and more flights now…that’s of course if SZX and CAN (and even ZUH) don’t work out. Yes, last I checked we could still get visas at the office in Wan Chai. With two kids in tow, I’m sure we’ll take the ferry to Jiuzhou this time. Can’t wait to see what horrible movie they’re screening these days. I’m imagining what the next panel of your cartoon might look like of “Bing shui man” in the WC after downing his precious ice water… Bahahaha! 🙂 Oh, and another round of congrats on being FP’d!! Big congrats Jen!!! Thanks very much! Being FP was a nice treat. Made me laugh – so true! But in Shanghai – this is becoming less common as now they start to assume all foreigners want – bing shui. Often I don’t – which then leads to another set of communication! I also “gone native” on the water temperature thing and somehow can now really enjoy a glass of hot water from time to time. Maybe that’s because the AC in Hong Kong/Zhuhai/Macau is often set way too cold. Beautifully written! Such a great way to portray the American business traveler. Fingers crossed that it’s only a small fraction that actually believe the world revolves solely around them….! This guy would have been looking for ice in a “banana republic” on the brink of civil war. He was a self-involved piece of work! I’ve come across that guy before in the Starbucks near my work. He always announces his order so the entire place can hear him, and he says “LET ME GET A…” at the start of it. I know it’s a cultural thing but it really comes across as astonishingly rude. Ha! Now I want to know what he orders. I can get over no bingshui but can’t get over people putting bing in pijiu in ktv’s. I guess in a place where people pick their noses walking down the street, huck luggies on shop windows just walking by or let their kids if not themselves go to the bathroom in public, talking loud is rude, like you don’t hear the natives ever do it. I suppose it wasn’t just that he was loud, but also that he expected everything in China should be exactly as it is “back home.” Too true that there are uncouth people to be found everywhere.